The Thirteenth Judicial District Commission on Judicial Performance unanimously recommends that Judge Michael J. Schingle BE RETAINED. 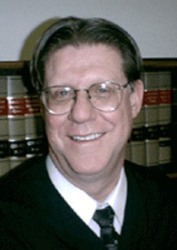 Judge Schingle earned a Bachelor of Arts in History from the University of New Mexico in 1977 and a Juris Doctor Degree from the University of Tennessee Law School in 1979. Before taking the bench, Judge Schingle was a private attorney in general practice with an emphasis in criminal litigation, and served as President of both the Morgan County local bar association and the Thirteenth Judicial District Bar Association. A former member of the Sunrise Optimist Club, Judge Schingle continues to volunteer in the club’s youth programs, including the annual Brain Bowl competition. He makes himself available for public speaking and has given programs to a number of civic groups. Judge Schingle’s performance was rated above average by both attorneys and non-attorneys in the majority of performance criteria, including: demeanor, fairness, communications, diligence, and application of law. The only area in which he was significantly lower than average, but still within acceptable ratings, was promptly issuing a decision on the case after trial. Judge Schingle is currently handling a case load of 110% to 120% of a full case load, which means that his docket is very difficult to manage. Judge Schingle is constantly seeking ways to make his court more efficient without cutting down on the attention he gives each case.